I actually started out this post hoping to make Lace Cookies. My idea was to use food coloring as paint, apply over lace and create a lacy pattern on top of fondant. I failed at this. Badly. As you can see by the cookie in the lower right hand corner. Consider this your cooking Rorschach Test of the day. What do you see when you look at the cookie blots? I saw the opportunity to do something else in the face of grim failure. Instead I used intricate stamps, pressed them into the fondant (as I have before) but this time I used the food coloring to blot the tops of the cookies et voila! We have wedding henna cookies! I adore henna. It's intricate, delicate, and so deeply touching. 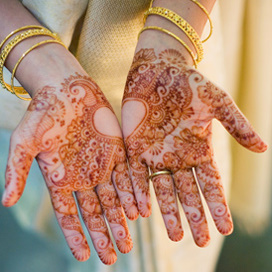 When I see beautiful pictures of this lovely tradition, I truly curse internally that I was born a little white girl, and as I peruse wedding blogs I fall increasingly in love with the bright warm colors and intricate patterns of Indian weddings. *Sigh. * Curse. * Soooo pretty (and so jealous). Making these cookies is wonderfully simple. Truly. Stamp. Cut. Blot. Done. That's my kind of cookie! Roll out fondant to desired thickness. Press with any design of rubber stamp. Cut the fondant using same cookie cutter as was used for the cookies. Adhere fondant to tops of cookies using corn syrup as a glue on the underside of the fondant to help it stick. Using a clean sponge (I used these) sop up some food dye and blot gently. Cream together the butter (I do not allow butter to soften), sugar and any flavorings you’re using. Beat until just becoming creamy in texture. Beat in the egg until well combined, make sure to scrape down the sides of the bowl. Add the sifted flour and mix on low until a non sticky dough forms. Knead into a ball and divide into 2 or 3 pieces. Roll out each portion between parchment paper to a thickness of about 5 mm. Refrigerate for a minimum of 30mins. Cut out shapes with cookie cutters or a sharp knife. Arrange shapes on parchment lined baking sheets and refrigerate for another 30mins to an hour. Preheat oven to 350°F. Bake until golden around the edges, about 8-15mins depending on the size of the cookies. Place the marshmallows in a large microwave-safe bowl, and microwave on High for 30 seconds to 1 minute to start melting the marshmallows. Carefully put the melted marshmallows into a greased stand mixer and stir the water and vanilla extract into the hot marshmallows, and stir until the mixture is smooth. Slowly beat in the confectioners' sugar, a cup at a time, until you have a sticky dough. Reserve 1 cup of powdered sugar for kneading. The dough will be very stiff. Coat your hands with powdered sugar and begin kneading the sticky dough. As you knead, the dough will become workable and pliable. Turn the dough out onto a working surface dusted with confectioners' sugar and continue kneading until the fondant is smooth and no longer sticky to the touch.